Budding entrepreneurs from Putney High School have scooped the Young Enterprise Best Company in Wandsworth Award. Their accessories company, ‘Lola is…..’ was recognised at the Central South Innovation Awards 2009, staged at the Institute of Directors. The girls will now represent the area at the Central London Regional Celebration event next month. ‘Lola is……’ has made more than £1,000 gross profit since September, making and selling accessories such as hats, hair bows, socks and bracelets. 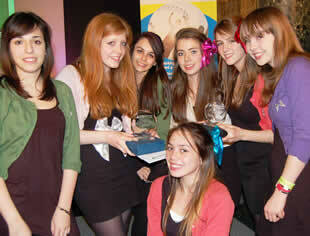 Led by Managing Director Fiona Steed, the sixth formers also won the Best Company Report category at the event. They have been supported by Putney High School teacher Susan Fairlamb and by two business mentors – florist Marion Blair, of Lavender’s Blue, and freelance marketer Phil Danter. A second Putney High School ‘company’, Beauty and the Knight also performed well at the event, where they showcased their pyjama making business.